We’ve made good progress this year as the Defra Data Programme continues to ramp up. As we strengthen the Defra Data Function, we’re always exploring new and different ways we can improve how we communicate and share our ideas and help solve problems across the group. 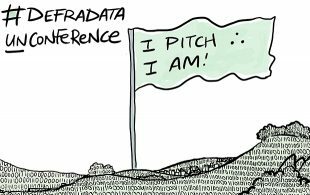 Thanks to an idea proposed by @davidbuckster not so long ago, over 130 representatives from across the Defra data function congregated in a room in Birmingham – #DefraData Function Unconference had begun. Rather than giving you a summary of what happened (you can explore that via various means like our Storify or looking back at the #DefraData hashtag), we thought who better to tell the story than the people who helped run the Unconference. I started this unconference very much focused on how we could improve engagement with external groups to increase the use of our open data, and possibly how that use could help deliver our some of our strategic goals to improve the environment. With the help of our special external guests we also gained great new possibilities and ideas for engaging with external groups, by the end of the day I was left realising that our engagement between Defra organisations is amazingly lacking. When we carried out a quick show of hands in the Better Engagement morning session (a group of over 30 people), over half used Twitter to engage with each other but only 2 people put their hands up to say they used the Defra Data Yammer group. We have a lot of thinking to do on what communication channels we choose to use, so that all the right people are connected and engaged. I also learnt how easily smaller organisations feel sidelined and cut out of bigger picture and cross cutting work. I’m pretty passionate about data, so I was always going to be excited about any form of data conference. But for me, the Defra Data Unconference felt like a really big step for our organisations. I’ve been working in data management/integration/quality for more than half my career in the Environment Agency. Time-after-time I’ve come up against problems, or found something new and cool, or had some weird data challenge and I’ve thought ‘I bet everyone else has this problem’ or ‘I wonder who else knows about this’. I’ve lost count of the times I’ve wished I could talk things over with other Defra data people but I’ve never known who they were. The Unconference was exactly what I’d hoped for: a chance to meet those people and start learning from each other. Given how much I was looking forward to attending the Unconference, I was thrilled to be able to help organise it. It’s only the second Unconference I’ve been to, but I was so impressed with the first (OpenDataCamp) that I knew how successful the format could be in bringing everyone together. I’ve been to some interesting regular conferences but there’s always been at least one session that was boring, irrelevant or impossible to apply to my work. I knew that an Unconference meant people would get to talk about all the things that really mattered to them. Being part of the organising team introduced me to a lot of different ways of working. I got into Twitter earlier this year but I’d only used Google docs a few times, and I’d never used slack. It was a great education in just how effectively we can work together across the Defra group. We collaborated on pretty much everything and I think the conference was better for having so many points of view involved. I had a few random ideas along the way but my favourite was the plan to measure how connected we all were before and after the unconference. Extending your network can be a huge benefit but it’s hard to quantify. I hoped to visually show the new connections after the conference. We sent out a survey before and after the Unconference and asked people which attendees they knew. New connections are shown in blue. I didn’t expect the results to be so clear! Not only did we grow our own networks (on average, people knew twice as many attendees after the event) but the graph also shows that the whole is closer together. Before the event, we had a few super-connected people joining across organisations. After the day, those connections reached deep into each organisation, connecting people across multiple teams and grade, bringing the function closer together! On a personal note: I got to meet people from Natural England looking at metadata questions that we’re also thinking about in the Environment Agency; I got a lot of new contacts working in the field of data quality; And I got the chance to co-run a session on data skills and career paths. I’m really looking forward to the continuing conversations that’ll follow on from these sessions. And to working more closely with my new Defra group friends and colleagues to help our data make a real difference. Having been to a couple of unconferences before, I didn’t feel that concerned about running an event with no agenda. What was concerning was whether we would have enough pitches to fill an agenda! I knew that if we didn’t have many volunteers to pitch that there were plenty of ideas within the organising team that we could run sessions on – but I really didn’t want that to happen. The great thing I’ve experienced about unconferences is getting to speak when you normally wouldn’t, and that equality of voice is the thing I value most. Luckily, we didn’t need to worry. When we opened the floor for session pitching, I was a little overwhelmed at the number of people who got up – it was brilliant. What then concerned me was getting through the number of pitches in the 5 minutes I had! At the start of the queue I kept looking at my watch, trying to keep people to their 30 second limit, but it was pretty tricky as the most important thing was to let them get their idea across. I saw a tweet during the day from @jukesie saying I’d done a good job of summarising the pitches on the fly, which was great to hear as I had hoped I made sense, but certainly wasn’t convinced. Once we got going, I think people really got the idea of pitching – trying to get to the essence of their idea, although there were a couple of folk I needed to ask to describe their pitch in 3 words (I’m looking at you Data Programme team!). Overall, I think people got the idea of the whole day – there was a good atmosphere, and the vast majority of people got stuck in to conversations, which was exactly what I had hoped for. My highlight of the day? The number of pitches, so many we nearly needed to run another session track. It showed the enthusiasm people have to talk about their work and share it across Defra. One not so good thing – the acoustics of the space made some conversations hard, but I hope that the session notes outputs mean that people are able to catch up on what was missed. I’ve been to a lot of conferences in my time in government, but I’ve never been to an unconference. After this Defra Data one, I’m sold on the concept. The day was a great way to bring people in the Defra Data Function together, to discuss and debate big issues. From the outset, it was evident that the Unconference has been something people in the Function have been keen to happen for a while, because there were so many people pitching ideas at the start of the day – arguably, too many to cover in just a few hours! But, thanks to the organising team, we managed to get the core ones discussed in the various sessions. What made the Unconference impressive for me was everyone wanting to engage with the discussions. it was great to have a number of our senior leaders there, to listen to what people on the ground were seeing as problems, barriers or solutions, but also to give their views on how we could collectively work to deliver a data-driven Defra. This open and collaborative atmosphere was really refreshing; we need to maintain this momentum and also act on as many of the outputs as humanly possible. If I was to reflect on what we could do differently next time or later down the line, I’d like to see how we could involve the Defra policy profession into the these sorts of discussions because, after all, they’re the ones looking at what Defra group does long-term. In turn, they can help us to prioritise the Function, and the Defra Data programme. It was great to see so many people from across the data function – people willing to share the issues they are tackling, and solutions, was a great demonstration of the function in action. I particularly liked the fact that we didn't limit ourselves to thinking about a data function in an overly structural way. People were comfortable that we had suppliers in the room with us – for example, our software and data suppliers – by incorporating them, they could help us understand what was possible and it will also give them insight into what we are trying to achieve. What I walked away thinking was that there is a huge power in coming together to just discuss issues; the unconference format worked, as the discussions were open and vibrant and there was very little footfall towards the exits before the conference closed. I thought the Unconference was fantastic! I've met a lot of really committed, passionate people in the Data Function already, but to have so many under one roof swapping ideas and trading experiences was incredibly exciting. One of the things I liked in particular was the open and engaging approach taken by all the participants – which meant we could properly get into how we work together across the group. And that was one of the main takeaways for me: how does the Data programme team help the data function to work together collectively? For one thing we want to keep having events like the Unconference and – following our twitter poll – the next one will be in six months. But we don't want to lose momentum in between, so we're going to set up a number of regular informal talks and meet-ups – watch this space for timings – and work out the best Comms channels to use (again, keep an eye on this blog). Then we'll need to work out (together) which areas we want to make a priority for some cross-function projects – there were lots to choose from in the session outputs. And anyone that would like to be more closely involved in how we're shaping the function, please tweet @opendefra. We're doing it again! May 2017 in Southampton. The most important thing that we’ve learned is the need to build and maintain connections across the Defra group. Over the next six months we’ll continue to think about how we can better support that (and you). We’re planning to be do more blog articles and lightning talks, and if you would like to contribute do get in touch. We're also thinking of hitting the road, something that we have always been keen to do is to get out of the #DataCave so if you would like us to visit let us know. And finally, we want to hold another Unconference in May in Southampton. So mark your diaries and if you’d like to volunteer then drop us a line. With your input, the Data Function will continue to build from the contributions we all make. Fascinating. Ever since joining Ofqual at the start of this year I have come across various innovative activities under Defra's digital transformation and open data initiative at different forums. I've been keen to attend some of your events; unfortunately got to read about them after the event. I'm hoping that by subscribing to this blog I will get advance notice - unless you would suggest some other better way?